Published Nov 2, 2018 by Addison-Wesley Professional. Since being released by Facebook, GraphQL has been adopted as the API standard of choice by companies such as GitHub, Yelp, Intuit, and the New York Times. GraphQL improves upon REST APIs by providing an explorable and self-documented way of getting exactly the data you need for your application. Whether you're working on a mobile app or a dashboard view, no matter how small or large the project, GraphQL is an important new tool for any application developer to know. This 4+ hour LiveLesson video course provides a thorough overview about the why's, what's, and how's of GraphQL, an API query language that has been making waves in the developer community. Given its potential to become the new standard for creating data APIs, this video series will give you the tools to discuss its pros and cons and implement it in a project. 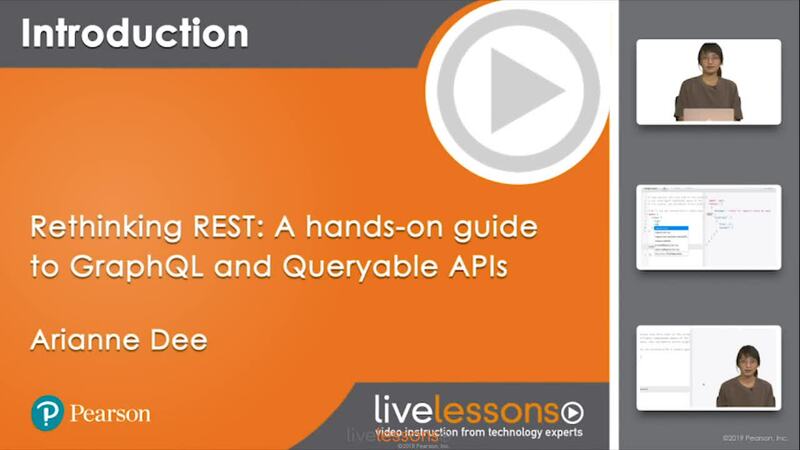 The lessons start with a high-level introduction to the language, its features, and best practices for creating a production-ready API. In the latter part, the lessons provide guided tutorials for creating a GitHub dashboard using their existing API and building your own GraphQL API from scratch using either the Node.js or Django frameworks.